Our last stretch in Ecuador was filled with adventure and a little difficulty for good measure. Glenn's poor bicycle had more than its fair share of problems, and our 150 km cruise down a secondary road turned out to be not exactly a 'cruise'. But as always we met some awesome folks along the road, including five inspiring cyclists. After crossing a few mountain ranges, we are now back down close to sea level, the air is dry, the days are warm, and the roads....are a lot flatter! We woke up early and packed up again, hoping that today's attempt to leave Loja would be successful. Glenn went off in search of a replacement ring, and after a few hours he was finally able to find one ! This seemed to do the trick, and Glenn was again able to ride up steep hills. So, around noon we were finally off! It was a 15 km climb out of the city, through lovely pine forests. It felt like being back in Canada, and we were tempted to tuck ourselves away in the forest and camp for the night - but we wanted to cover some ground so we carried on. As we were slowly moving up the hill we spotted two touring bikes, and rang our bells excitedly! Having a rest on the side of the road we found Lucas and Thea, an Argentinian-Mexican couple making their way south to Argentina. We chatted for a while, then we carried on up the hill. We had a delicious descent to the hot Catamayo valley, during which we lost about 1300 meters. We found the Bombero station it town, and they were happy to let us camp on the roof. It was extremely windy and the sun was very hot, so we used two soccer nets to string up a tarp for the sun, and hold our tent down... It seemed to do the trick more or less, but I was a little concerned that we we would thrown off the roof if our tarp got caught in a particularly strong gust of wind. A little later in the evening, Thea and Lucas showed up as well and so we shared out rooftop campground! At night it became much cooler, and we fell asleep to the sounds of the circus that was also visiting the town. We had a choice of two roads from Catamayo, the predictably smooth Pan-Am highway or a secondary road that would be a little longer in distance and would be in unknown condition. We were on the fence until about five minutes before we road away from the Bomberos, when we decided to give the secondary road a chance... The road followed a river for the first 10-15 km, and was in good condition. Then it began to climb steeply, and the sun was hot! but we slowly...very slowly made our way to the first pass, some 1200 meters above Catamayo. It was generally pavement, but there were some dirt patches, and plenty of potholes. Luckily the traffic was light and the people were friendly. We descended a little into the town of Gonzonama and found a cheap place to stay almost right away. We were very tired, so we made our own super and went to bed early! We had a short day planned, mainly because the distance between towns meant that we would have a short day or a really long day. We have probably mentioned this before, but when riding in the mountains, the km distance becomes somewhat arbitrary. It really is more the ups and downs that count.... Since we don't have an altimeter we can't record exactly how much climbing we do.... But generally it is a lot! Anyways, we thought today would be a short day, but a combination of steep climbs and deteriorating road conditions meant that we covered the 28 km in about 4.5 hours! When we arrived in Carimanga mid-afternoon we found a bustling town. We had some food in the central plaza, and unfortunately our timing coincided with school being let out... Which resulted in many students yelling out the school windows all the English they could think of "hello, how are you, what is your name, how old are you...." We indulged them a bit but yelling across the plaza wasn't very fun. When they actually came out of the school a little while later, they all became very shy and would barely look at us! We made out way to the Bomberos and were warmly welcomed. Pablo, one of the firefighters, is an avid cyclists and general adventurer. He introduced us to his cousin Pedro, who also love all things outdoors. Nearby Pedro had built a small climbing wall, which Glenn got the chance to try out. Again, it was early to bed and fast into a deep sleep. The poor quality road continued today... Which more than likely is the reason that about two kilometres into our ride Glenn's front rack fell off! Luckily we were going slowly enough that Glenn was not hurt at all and the rack was salvageable. But about an hour was spent remedying the situation. Some might remember that way back in Mexico my front rack also fell off... And you may be rightly thinking that perhaps we did not choose the best quality racks? Perhaps not, they cost $13.00 at MEC (a Canadian outdoors store). We have met other cyclists who have spent $50-100 on their front racks, and I'm ashamed to admit that we smirked at this, singing the praises of our economical racks. Well, maybe we should have invested a little more. For now, we will work with what we have. We have now built in a safety measure using rope. We had a long steep sweaty climb before our descent towards the Peruvian border. Sadly, just as we reached the summit the road deteriorated into near rubble at times... Making it difficult to go much faster than 15 km/h. In addition to this, we found ourselves riding through thick fog and sliding around on the rocky, muddy road. 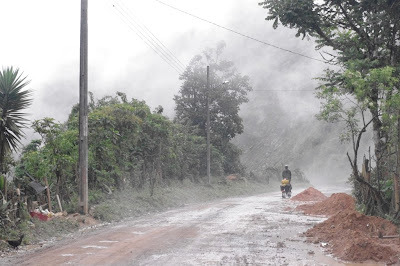 We had considered trying to make it all the way to the border town of Macara, but when we reached Sozoranga at about 4pm, thoroughly shaken by the rocky situation, we called it quits for the day! Another quiet night, terminating in passing out! More descent on rocky roads to start the day, another 15-20 km or so. At least we anticipated it this time! The road then improved a bit, with only potholes to contend with. The ecosystem changed dramatically the further we went. Becoming very dry and hot, with interesting brightly flowered trees, and chirping birds. We rolled into Macara around noon....and started looking for ice cream :). A few minutes later we were approached by a couple, who explained to us that they were also travelling by bicycle and had ended up with a giant house to stay in, right in town. Turns out that Frederico and Brenda, an Argentinian couple, had hitched a ride for their last stretch in Peru. The driver was a wealthy Argentinian who happened to have rented a huge empty house in Macara, and offered it to Frederico and Brenda to rest up in for awhile. It was indeed a huge house, room after room, and six bathrooms! It was great to chat and exchange some info about routes, as they have been travelling north. Even though today was short.... We passed out again that night!